Maureen E. Mulvihill | Princeton Research Forum, N.J.
Wonderment and ingenuity are the twin themes of H.L. Meakin’s new book. Assuring her value to early-modern scholarship, Meakin (University of South Florida, Tampa) has contributed a second monograph of broad utility to specialists. Her first book, John Donne’s Articulations of the Feminine (Oxford UP, 1999; 288 pp), examined figurations of women in Donne’s poetry and prose through the modern lens of French feminist philosopher Luce Irigaray, a refreshing and bold approach. 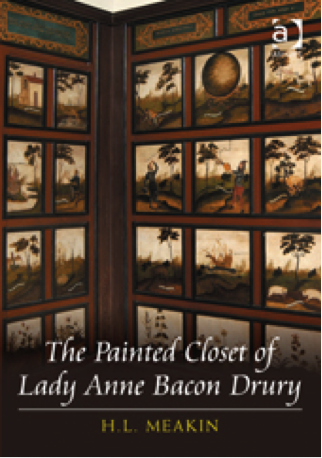 Meakin’s second book interrogates the life, interests, and visual wit of a highly placed patroness of Donne’s circle: the intriguing Lady Anne Bacon Drury (1572-1624). In addition to supplying a closely sourced biographical context on Lady Drury — pedigree, influences, travels to the Continent (one such, with Donne) — Meakin capably sorts out the many puzzlements of Lady Drury’s famous painted closet. This unusual, very private female space was evidently devised and designed by Lady Drury herself in the early 17th century. Before its reinstallation at Hardwick House, Suffolk, and then at Christchurch Mansion, Ipswich, Suffolk, the original site existed in the “glittering” Drury family seat of Hawstead House, Suffolk. This decorative chamber was originally a small intimate compartment (a cube, 7-feet square), displaying a curious series of over 50 illustrated wooden panels, evidently designed, painted, and sequenced by Lady Drury. These famous ‘Hawstead Panels’ have dazzled specialists in early-modern visual arts; and we now welcome Christopher Poulson’s analysis from the allied field of art site installation and spatial design (thesis, 2008; 120-146, 196-202). Yet, no one, to date, has taken the subject further than Meakin, nor understood it as well. 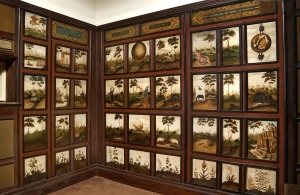 Image left: Jacket, Meakin’s Lady Drury, with background detail of emblematic paneling in Drury’s painted closet, originally at the Drury seat, Hawstead House, Suffolk, early 17th century. Image right: Another view of Lady Drury’s private chamber, reinstalled, 1924, Christchurch Mansion, Ipswich Museum, Suffolk UK. (1) In addition to Meakin’s intelligent selection of subject, it is the on-site, interdisciplinary methodology which guarantees the book’s success. As the book’s detailed notes (258-273) and extended acknowledgments (xiii-xiv) show, Meakin spent dedicated time at the present site of the Drury closet, in Ipswich, and she benefited from talks with its present keepers and historians. Dr. Meakin also conducted archival research on the Bacon-Drury line at many U.K. and U.S. libraries and museums for extant pedigrees, visual likenesses, letters, journals, and print materials, all with an eye to grounding the families’ intellectual and artistic connections. Meakin likewise probed the vogue of the Renaissance painted closet, both in England and on the Continent, noting its strong meditative and spiritual traditions in emblem books, meditative writings and manuals, classical and religious mottos, and other specialized material. Not least, Meakin wisely maintained close contact with other scholars in the field, eager to acknowledge and advance their contribution (see, e.g., her many responses to Norman Farmer’s work). 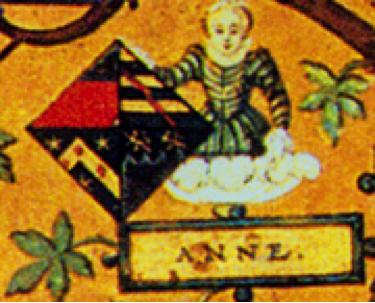 Image left: The only recorded rendering, to date, of Lady Anne Drury, on the Bacon family pedigree, touching the shield of her line of the Bacon family. A formal portrait of Lady Drury by her younger brother, respected painter Sir Nicholas Bacon, has not (to date) survived or been recorded. Image right: The curious “mermaid” image, evidently designed and painted by Lady Drury, an exotic and curious emblematic panel (perhaps alchemical), Hawstead House, Bury St Edmonds, Suffolk UK. 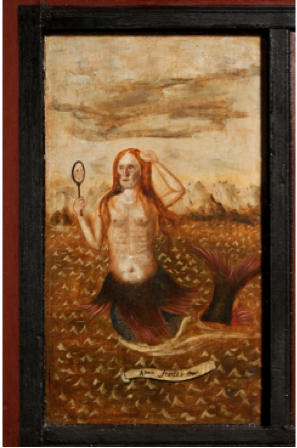 We might mention a lost opportunity in the book’s narrative; namely, the generic distinction between Drury’s painted closet and the popular wunderkammer (plural, wunderkammern), being closets of wonders, curiosity cabinets. The Drury painted closet is a small private space, constructed for the use of one occupant, for the purpose of meditation and spiritual ‘looking’ and discovery. The popular wunderkammern, forerunners of natural history museums, were small public collections of rare exotica from the natural world (rare shells, corals, insects) and other arcana (prized vases, unusual visual and decorative art), all being the cache of foreign travel and displayed in small congested closets (2013 Grolier Club show; Duchess of Portland’s Museum; contact bookseller Paul M. Dowling, Liber Antiquus, Chevy Chase, Md.). Owing to its range, Meakin’s Drury will be valued by specialists in art history, feminism, meditative practices, emblemology, and art site design and installation. This is a unique and special book, and a beautiful one. Maureen E. Mulvihill is a rare book collector and a specialist on English and Irish women writers, and the visual arts. In addition to her essays and articles, Dr Mulvihill’s book credits are: Poems by Ephelia (1992, 1993); Thumbprints of ‘Ephelia’ (2001); ‘Ephelia’ (2003); Poems by Mary Shackleton Leadbeater (2008); and, as Advisory Editor, Ireland & The Americas, 3 vols (2008). She is at work on Irishwomen’s political writings and response, c1603-1801.